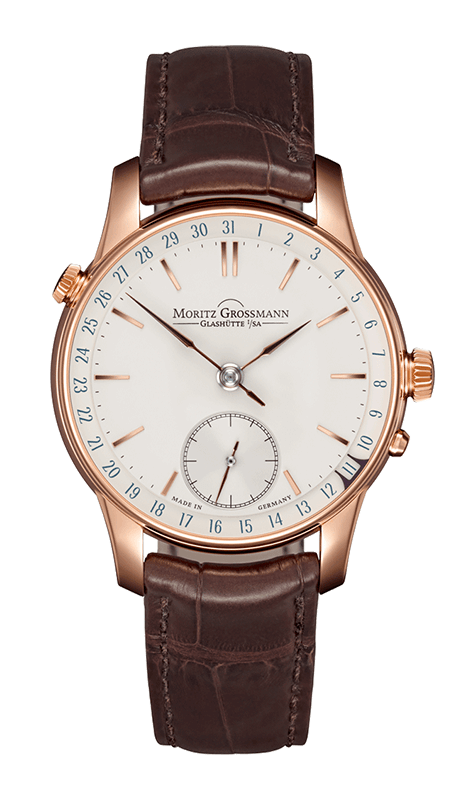 Apart from the exact time, what people want to know most when they look at their watches is the current date. So the date display ranks just behind the hour, minute, and seconds indications even though it is a comparatively recent development in the long history of horology. 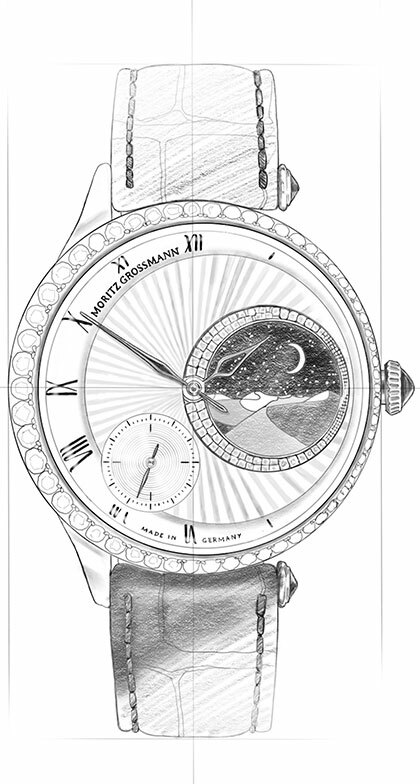 The first wristwatch with an analogue date was introduced in the early 20th century. 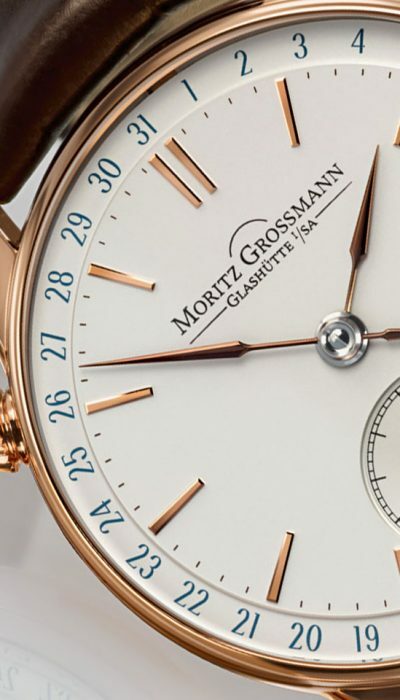 Grossmann‘s watchmakers are taking their inspiration from this classic display type but have perceptibly evolved it: their jumping date is remarkably easy to use. The DATE emphasises the date indication with a complete scale and the highly functional design of the date marker. The calibre 100.3 in the DATE is based on the calibre 100.1, preserving many essential components. 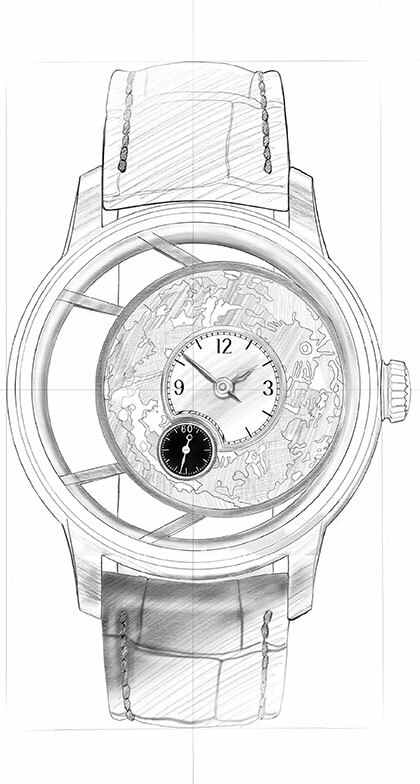 But to integrate the jumping date mechanism on the dial side of the movement, several key parts had to be redesigned. 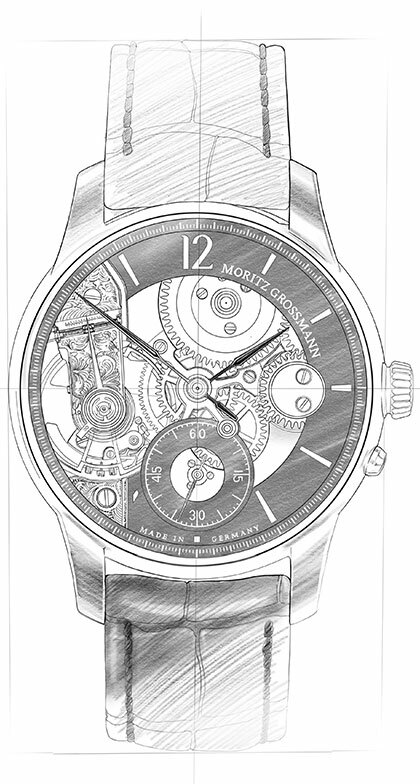 The additional setting crown at the 10 o‘clock position reveals the complication at first sight. 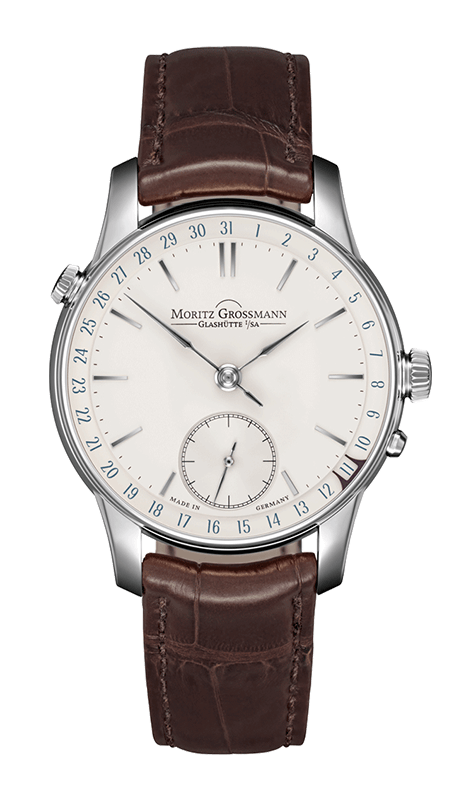 The DATE stands out with the sleek lines of a perfectly reduced case shape, which is a characteristic element of the model family. 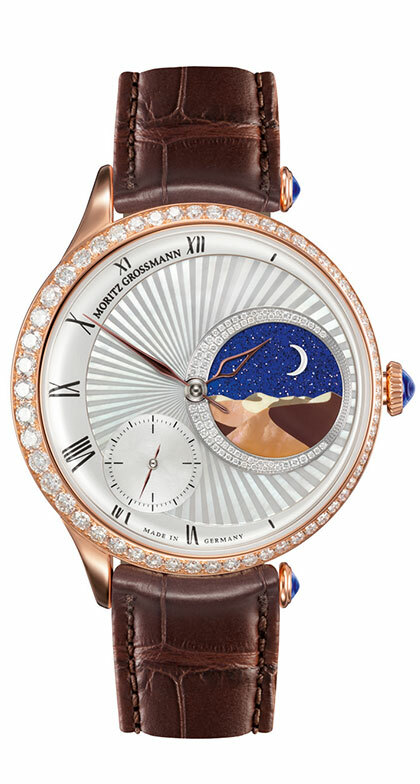 It is available in rose and white gold. 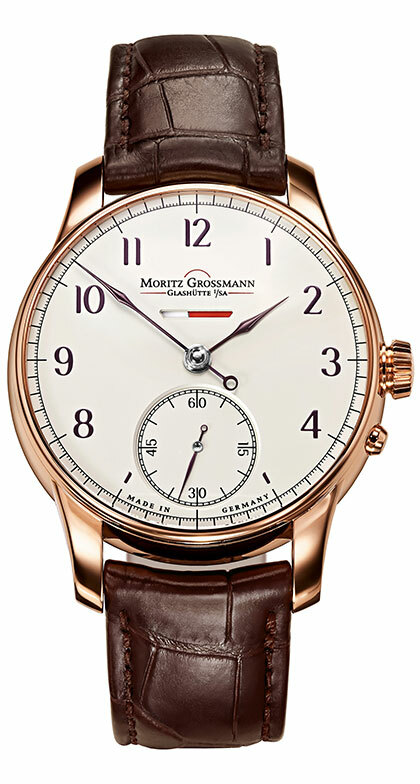 The pusher beneath the crown of the Grossmann manual winder and the separate date setting crown on the opposite side at 10 o‘clock are visible manifestations of this model. 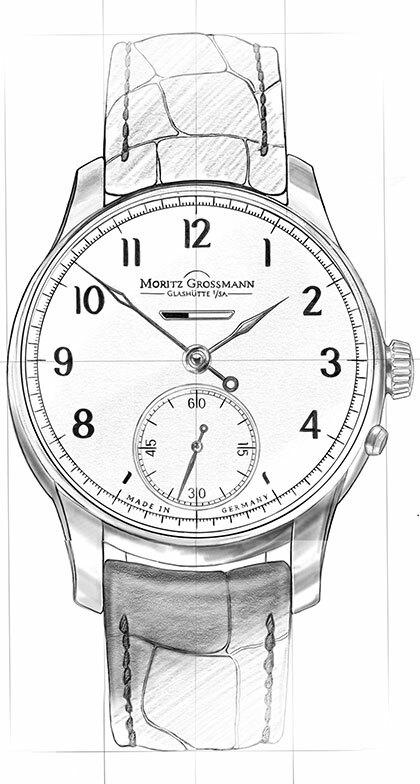 The design objective of the Grossmann date was clarity of style paired with simple, problem-free operation. This convenience immediately comes to the fore when the date needs to be corrected, for instance at the end of a month. The date can be changed in either direction at any time while the movement continues to run. The date crown is pulled out and turned in the desired direction until the marker lines up with the current date. When the crown is pushed home, a spring causes the date ring with the marker to precisely engage in the right position. 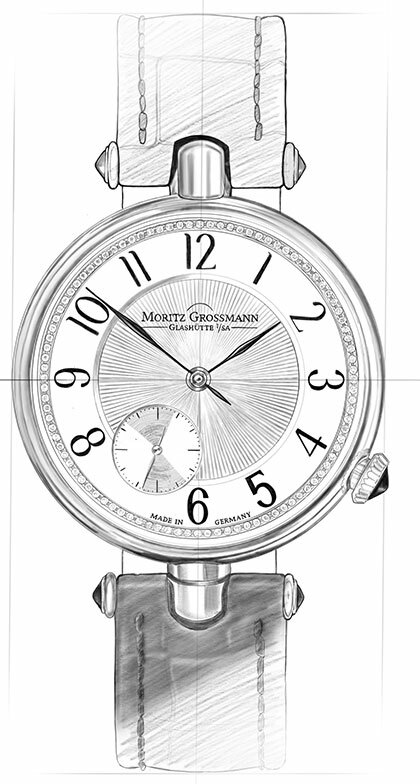 On the solid-silver dial, the minute scale was moved slightly inward to make space for the date scale. Its crisp Arabic date numerals are blue and thus contrast well against the time scale. Instead of a conventional date hand from the centre, the date marker moves along a peripheral ring and therefore does not compete with the minute hand. Its bracket shape clearly frames the current date. This type of indication, with a complete scale from 1 to 31, evokes an impressive consciousness of how steadily a month elapses. The jumping date display of the calibre 100.3 relies on a complex system composed of a date ratchet wheel with a switching finger and switching finger spring as well as a release lever, a switching star and a date ring with the marker. 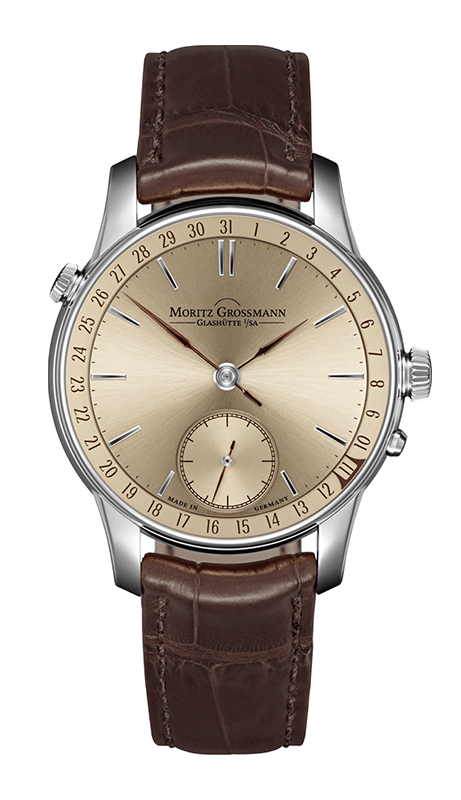 As a typical hallmark of this model family, the face of the DATE is graced with lancet-shaped hands. They are manually crafted and finished for all of the manufacture‘s models. 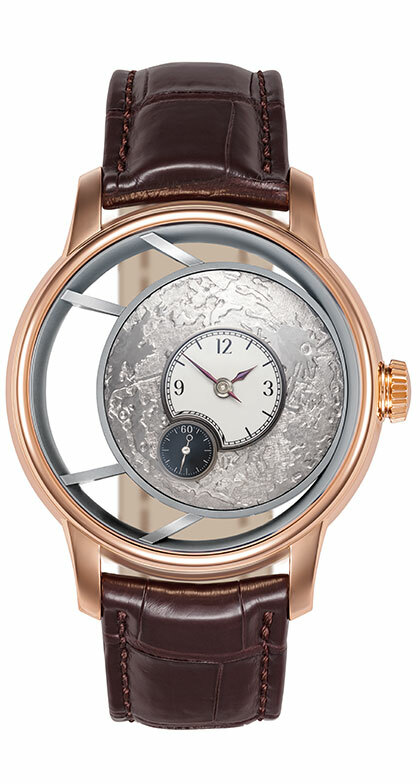 The seconds, minute, and hour hands are annealed to a brown hue for the rose gold cases. 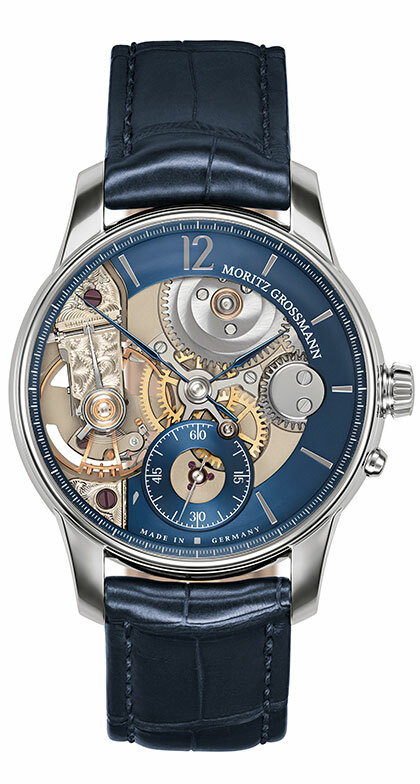 For the whitegold version, all hands are made of polished stainless steel. The date marker was newly developed as a substitute for a sweep hand. It sits on the outside of the date ring suspended beneath the dial and advances day by day along the scale of 1 to 31 days in the clockwise direction, completing a full revolution every 31 days. The date marker is also lavishly handmade and annealed to a brown-violet hue as a contrast to the blue date numerals. 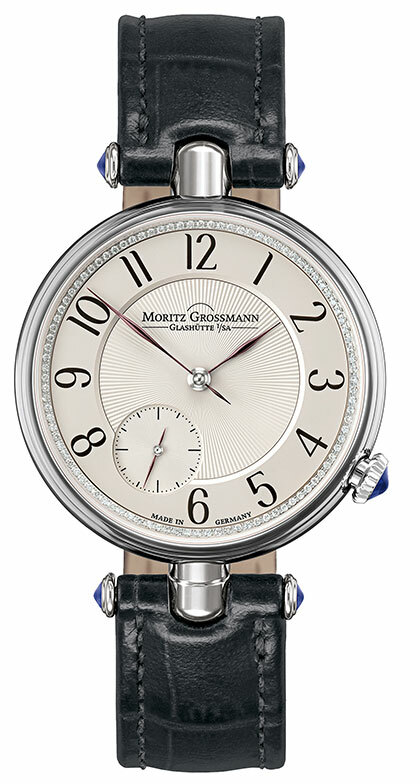 With its bracket shape, it clearly frames the current date numeral, assuring fast and crisp legibility. Discover everything about the heart of the DATE.